A look at the Facebook, Twitter, and Reddit pages that shared the USA TODAY version of the Arizona Republic story. Talk about a #win. As of early August the story, about an Army veteran’s dying wish, has surpassed 220,000 page views, according to Louie. A look at CrowdTangle’s Chrome Extension shares for the Arizona Republic story. “That traffic is 79% social and includes 192k unique visitors. 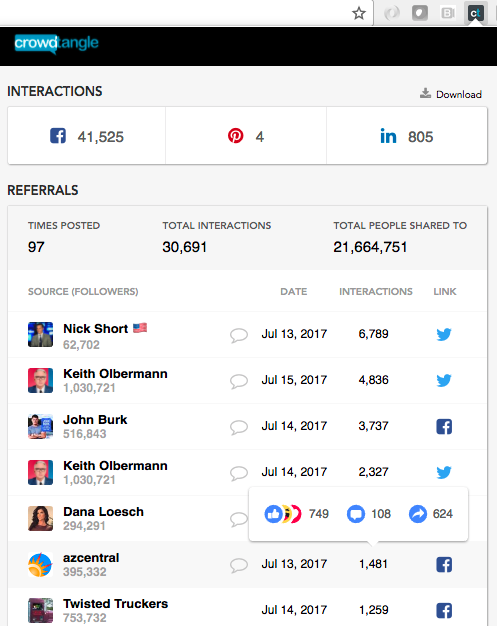 The CrowdTangle Chrome Extension tells me that it was shared to more than 19 million people across various Facebook, Twitter, and Reddit pages (the total followers of these pages combined),” Louie says. “To say it’s a metrics success for us is a massive understatement. The story was cross-posted to usatoday.com, part of the wider USA TODAY NETWORK family which the Arizona Republic is part of, where it notched over 41,000 more Facebook shares, and was shared to over 41 million more people, according to CrowdTangle’s Chrome Extension. “We use CrowdTangle every day across the USA TODAY Network to track how we’re doing on social, see what interesting stories are being shared, and look for new ideas, just like this success story out of Arizona. Social listening is a key part of our strategy and CrowdTangle is an important tool that helps us listen to and engage with our audiences across the country, and create work that we know will resonate,” says Mary Nahorniak, deputy managing editor for digital at USA TODAY. So how did Louie and his team use CrowdTangle to find this story? Louie and his team have created their own CrowdTangle dashboards, where they can experiment with content discovery in custom Lists and Saved Searches. “I spend a considerable amount of time combing through Facebook, Reddit, and Twitter for story ideas,” Louie says. Metrics outline how the Arizona Republic story overperformed, according to CrowdTangle. Success for Louie revolved around hyper-detailed search criteria. “My biggest tip for CrowdTangle is that you need to be consistent and detailed. I have also begun filtering by underperforming for certain terms to hopefully reveal some hidden gems,” he says. CrowdTangle allows users to set up a range of different viral alerts, which are sent via email or Slack when a post overperforms. These alerts can be customized based on specific Lists or Saved Search keywords, and can also zero in on video-specific, most shared, or image-centric content. “We have social champions and reporters scouring CrowdTangle at all times of the day to help find stories our readers can connect to,” Louie adds. “I can’t stress enough how much information CrowdTangle can give social managers. Being able to compare our results to other outlets, for example, really helps us gain a sense of place. Being able to critically look at how our posts perform and what our audience interacts with has been a game changer. It is essentially a real-time metric tool that helps you create accountability for the job your social team is doing. That is invaluable,” he says.